posted: September 28, 2018 by: Kim Moran Tags: "Clinic Specials" "News"
WNC Veterinary Hospital is proud to be a sponsor for the WLOS News 13 Pet Project. Join us for this event on October 19th. Along with WLOS, we are partnering with seven local humane societies/rescue groups to help animals in our area find a forever home. Our staff will be there to answer questions and provide free instruction on how to properly care for your pet. Thousands of animals are surrendered, lost, or abandoned in our community each year. They are brought to our local shelters where they are safe until they find a permanent place to call home. Animal shelters/rescues need funding to pay for medical bills, food, supplies and labor to care for each of the animals as they become healthy or old enough for adoption. Adoption is the best option because it provides homes for animals who would otherwise have nowhere else to go and makes room for more animals coming through shelter doors every day. By adopting, you are saving a life and enabling animal welfare groups to continue helping the lost and homeless animals of our community. The animals up for adoption in our community will be there from 9 am - 6 pm. You can come meet them and start the adoption process. Special Pet Project adoption rates will be only $100. We will be collecting pet food, pet supplies, cleaning supplies & monetary donations for all of the local rescues that day. 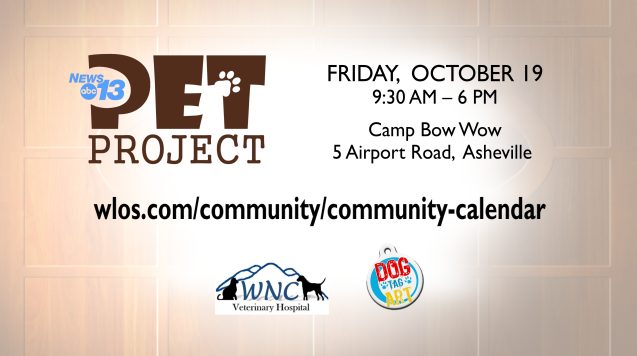 Join WNC Veterinary Hospital for this event and a find a new forever friend!